The immune system of neonates is clearly distinct from that of adults. Various hypotheses have been proposed to explain this phenomenon, mostly focusing directly or indirectly on T cell specialization (1, 2). Because epidemiological studies have shown a correlation between the provocation of the immune system during early infancy and a reduced incidence of atopic diseases later in life (3), plus the dramatically increasing incidence of atopic diseases in industrial countries, the study of the development and differentiation of Th cells at different ages has recently gained increased importance. Naive CD4+ T cells differentiate into mature Th cell subtypes such as Th1, Th2, Th9, Th17, and regulatory T cells that possess different functions. The differentiation of Th cells toward distinct Th phenotypes is currently considered to be dependent on various extrinsic factors, including the strength of the antigenic stimulation (4), engagement of costimulatory molecules (5, 6), and presence of cytokines as critical mediators (7, 8). Although differentiation of naive Th cells into the various effector subtypes occurs in the elderly as well as in infants, it is plausible that age-dependent molecular programs impacting naive Th cell differentiation exist. So far, studies on age-related intrinsic changes in murine and human T cells have reported several molecular mechanisms that cause alterations in the intrinsic capacity of T cell function and differentiation. Naive T cells from aged mice show defects in peptide-specific activation (9), changes in cytoskeletal rearrangements, and signal transduction events (10, 11). In addition, aging impairs T cell proliferation while at the same time prolonging the naive T cell lifespan by decreasing Bim expression (12, 13). Impediments in neonatal immune function have long been explained by the predominance of Th2 immune responses in neonates, which can increase the susceptibility to atopic diseases (14–17). However, this view has recently been questioned by a large cohort study that disputed a global Th2 cytokine bias in pregnant mothers and newborns (18). This and other previous studies on the newborn Th2 bias have often been limited by their reliance on assessments of the overall reactivity of total CD4+ T cells derived from PBMCs and long-term polyclonal stimulation in vitro. Furthermore, the focus of many studies was limited to molecular studies on signaling in total CD4+ T cells (19). However, some studies have started to decipher age-dependent changes in the pools of naive T cells (20–22). In these studies, a differential distribution of two subpopulations of naive CD4+ T cells—CD31+ recent thymic emigrants (thymicCD31+ naive T cells) and CD31− homeostatic proliferating cells (centralCD31− naive T cells)—has been described for neonates and adults. Although it has been proposed that these T cell subsets dramatically shape the immune response especially in early childhood, their functional characteristics such as cytokine expression and stability are not yet known (21, 23). Although earlier studies assumed a linear T cell development (i.e., all naive CD31+CD4+ T cells leaving the thymus are qualitatively indistinct, independent of age), more recent studies proposed that the appearance of distinct T lymphocyte precursors is dependent on the developmental stage of the organism (24). This concept also arose from the hypothetical need for a tolerogenic T cell compartment during fetal development. One study comparing hematopoietic stem cell precursors from fetal and adult naive CD4+ T cells found a more pronounced regulatory potential and phenotype in fetal naive CD4+ T cell precursors (24). The authors explained this phenomenon using a corollary of the previously proposed concept of a layered immune system, whereby the initial wave of lymphopoiesis wanes as the adult wave is established (25, 26). So far, the accuracy of the layered immune system hypothesis, which could require an intrinsically poised cytokine production in neonates as well as a link between cytokine production and the developmental stage of the organism, has not been rigorously established. To investigate whether an intrinsic bias toward Th2-type differentiation exists in infancy, we investigated the expression of Th2-related molecules, such as the IL-4 isoform (27). We report in this study that a Th2-like phenotype was observed in neonatal and infant naive CD4+ T cells and that neonatal naive CD4 T cells preferentially differentiated into mature Th2 cells. The novel neonatal Th2 cell subset was characterized by the expression of the IL-4 isoform that does not enter the secretory pathway. A significant proportion of these cells rapidly developed into mature Th2 cells. The bias toward Th2 differentiation was abrogated in an inflammatory setting, whereas it was stabilized in an immunosuppressive environment. Taken together, these data indicate the existence of a Th2-biased CD4+ T cell development program in neonates and infants that differs from early CD4+ T cell development in adults. This study was approved by the Clinical Research Ethics Board of the University of Magdeburg (certificates 06/11, 79/07, and 26/12), and all parents provided written informed consent in accordance with the Declaration of Helsinki. Cord blood (CB) samples were obtained from umbilical cord veins immediately after the delivery of the placenta at the Women’s Clinic of the University of Magdeburg. PBMCs were obtained from leukocyte reduction filters (Sepacell RZ-2000; Asahi Kasei Medical) at the Institute of Transfusion Medicine and Immunohematology and the blood bank at the University Clinic of Magdeburg. Adenoids were obtained from the clinic for Ear, Throat, and Nose Medicine at the University Clinic of Magdeburg. Surgically excised adenoids were placed in PBS, and cell suspensions were isolated from tissues by gentle homogenization and passage over a 70-μm cell strain (BD Falcon). CB mononuclear cells and PBMCs from filters from healthy donor samples were purified using a Ficoll 400–based (Lymphocyte Separation Medium LSM 1077; PAA Laboratories, Pasching, Austria) density gradient. Naive CD4+ T cells were enriched to high purity (>98%) from CB mononuclear cells by separation with a magnetic hand sort and from PBMCs by separation using the autoMACS Pro (Miltenyi Biotec, Bergisch Gladbach, Germany) (Supplemental Fig. 1). Briefly, CD45RO+ effector and memory cells were depleted with CD45RO-Microbeads. CD45RA+CD4+ T cells were obtained by subsequent positive selection of CD4+ T cells using CD4-Microbeads (Miltenyi Biotec). For purification of CD31+ and CD31− subsets, freshly isolated naive CD4+ T cells or naive CD4+ T cells that had been cultured for 4 d were labeled with CD31-Microbeads and separated with a magnetic hand sort (Miltenyi Biotec). The mean fluorescence intensity of the CD31+ and CD31− accounted for 600 compared with 100 according to FACS analysis (Supplemental Fig. 1). Naive CD4+ T cells were cultured at 37°C in either serum-free X-VIVO-20 (Lonza, Verviers, Belgium) or RPMI 1640 medium (Biochrom, Berlin, Germany) supplemented with 10% human AB-plasma and penicillin-streptomycin. For polyclonal stimulation, 1–2.5 × 105 CD45RA+CD4+ T cells were cultured in U-bottom 96-well plates with 0.5–1.25 × 105 microbeads coated with anti-CD3 and anti-CD28 (at a cell to bead ratio of 2:1), according to the manufacturer’s instructions (T Cell Activation/Expansion Kit; Miltenyi Biotec). To generate the microbeads, both Abs (100 μg/ml) were mixed at equal concentrations prior to coupling. IL-4 (Miltenyi Biotec), IL-6, IL-1β, IL-12, or TGF-β (10 ng/ml or as indicated; all purchased from eBioscience, San Diego, CA) were added on day 0 and maintained throughout the experiment. For flow cytometric analysis, cells were stained following restimulation with 10 ng/ml PMA and 1 μg/ml ionomycin (Sigma-Aldrich, St. Louis, MO). All cells were restimulated for 4 h except for cell preparations from adenoids, which were ex vivo stimulated for 16 h. Brefeldin A (Sigma-Aldrich) was added to a final concentration of 5 μg/ml for the final 2 h of restimulation. Cells were surface-stained with allophycocyanin-coupled anti-CD4 (RPA-T4), FITC-coupled anti-CD45RA (HI100), PE-coupled anti-CD45RO (UCHL1; BD Biosciences, San Jose, CA), Pacific Blue–coupled anti-CD4 (RPA-T4), and PE-Cy7–coupled anti-CD31 (WM59; BioLegend, San Diego, CA). For intracellular staining, cells were fixed with 2% paraformaldehyde, permeabilized with 0.5% saponin (Sigma-Aldrich) in PBS/0.2% BSA, and incubated with FITC-coupled anti–IL-2 (MQ1-17H12), PE-coupled anti–IL-4 (MP4-25D2, hereafter referred to as MP4; BioLegend), APC-coupled anti–IL-4 (8D4-8; BioLegend), and PE-Cy7–coupled anti–IFN-γ (4S.B3; BD Biosciences). For cell-proliferation analysis, cells were labeled with 1.6 μM CFSE (Molecular Probes-Invitrogen, Carlsbad, CA) on ice for 3 min and quenched with serum-containing medium. Cytometric analyses were performed using FACSCanto II (BD Biosciences) together with FACSDiva software Version 6.1.2 (BD Biosciences) to collect and compensate the data and FlowJo software Version 7.6.5. (Tree Star, Ashland, OR) for final data analysis. The gating strategy was as follows: cells were first selected as singlets applying forward light scatter (FSC)-area/FSC-height, followed by selection of lymphocytes applying the FSC/side scatter gate, and finally CD4+ T cells were gated. ELISPOT plates (96-well MultiScreen HA; Millipore, Billerica, MA) were coated with 2 μg/ml anti-human IL-4 mAb (either MP4 clone or 8D4-8 clone; both from BioLegend). Cells were cultured in the presence of PMA and ionomycin for 16 h at 37°C/5% CO2, plated at 1 × 105 or 5 × 105 cells/well, and titrated at a ratio of 1:5 for the ELISPOT assay. Cytokines were detected with a polyclonal biotinylated anti-human IL-4 Ab (R&D Systems, Minneapolis, MN). The samples were developed using 0.3 μg/ml extravidin-alkaline phosphatase (Sigma-Aldrich) and a Vector Blue Alkaline Phosphatase Substrate Kit III (Vector Laboratories, Burlingame, CA). The mixed cellulose ester membranes (HA; Millipore) were punched out of the wells onto a sticky plastic sheet. The sheet was scanned at high resolution (1200 ppi), and the membrane circles were analyzed. Spots were scored by eye, whereby positive spots had a well-defined circular shape and were homogenously granulated. Microscopy was performed using a Zeiss Axiovert 200M-based epifluorescence wide-field imaging system (Carl Zeiss MicroImaging). The Axiovert 200M was equipped with a fluorescence filter set, including Zeiss No. 49, HQ-FITC (excitation band pass 480/40, beam splitter (BS) 505, emission 535/50), HQ-Cy3.5 (excitation 565/30, BS 585, emission 620/60), and HQ-Texas Red (excitation 560/55, BS 595, emission 645/75) (all from Chroma Technology, Bellows Falls, VT), a scanning stage (Maerzhaeuser Wetzlar), and an AxioCam MRm camera (Carl Zeiss MicroImaging). Acquisition and device control were performed using AxioVision 4.8 (Carl Zeiss MicroImaging). Z-stacks for deconvolution were acquired with plane priority using a Plan-Apochromat 63×/1.4 and a nyquist sampling rate according to the methods described (28, 29). Postprocessing and image analysis were performed using AxioVision 4.8 (Carl Zeiss MicroImaging) and ImageJ (Rasband, WS 1997; National Institutes of Health, http://imagej.nih.gov/ij). Epifluorescence wide-field z-stack deconvolution was performed using Huygens 3.3 (Scientific Volume Imaging, VB Hilversum, The Netherlands) with a classic maximum likelihood estimation algorithm and experimental or theoretical point spread functions. Whole-cell lysates were prepared, and proteins were extracted in a hypotonic buffer (20 mM HEPES, 20 mM NaF, 5 mM EDTA, 1% Nonidet P-40, 0.1 mM PMSF, 40 mM β-glycerophosphate, 2 mM Na3VO4, and protease inhibitors). Extracted proteins were separated on 10% SDS-polyacrylamide gels and probed with an anti-GAPDH Ab (Santa Cruz Biotechnology, Santa Cruz, CA) and anti–IL-4 polyclonal Ab (R&D Systems). Quantification was performed using the ImageJ software (Rasband; National Institutes of Health). Proteins were separated using a Tris-glycine gradient gel (4–20%; Invitrogen) under standard conditions. After staining with Coomassie G-250, protein identification was performed by tryptic in-gel digestion and nano–liquid chromatography–tandem mass spectrometry (LC-MS/MS) experiments as previously described (30). Briefly, tryptic peptides were separated using an LC system (Eksigent NanoLC 2D; Axel Semrau) connected to an LTQ-Orbitrap XL mass spectrometer (Thermo Scientific, Waltham, MA). LC separations were performed on a capillary column (Acclaim PepMap100 C18, 3 μm, 75 μm × 250 mm; Thermo Scientific) at an eluent flow rate of 200 nl/min using a gradient of 4–60% B for 115 min. The mobile phase A consisted of 0.1% formic acid in water, and the mobile phase B consisted of 0.1% formic acid in acetonitrile. Data were acquired in a data-dependent mode using one MS scan followed by MS/MS scans of the most abundant signals. Tryptic peptides, covering the IL-4 sequence, were preferentially selected for MS/MS. The processed MS/MS spectra and MASCOT server version 2.2 (Matrix Science, London, U.K.) were used to search in-house against the SwissProt protein database. A maximum of two missed cleavages was allowed, and the mass tolerance values for precursor and sequence ions were set to 10 ppm and 0.35 Da, respectively. Methionine oxidation and the acrylamide modification of cysteine were used as variable modifications. Total RNA was extracted using the NucleoSpin RNA II kit (Macherey-Nagel). To prepare first-strand cDNA from the isolated RNA, TaqMan reverse transcription components were applied using oligo(dT) priming (Applied Biosystems, Foster City, CA). Primers for GATA-3 (31) and STAT6 (32) were obtained from TIB MolBiol. Quantification of the cDNA samples was performed by quantitative real-time PCR in triplicate using Maxima SYBR Green/ROX qPCR Master Mix (Thermo Scientific). The expression of each gene was normalized to the expression of GAPDH using the ∆∆ threshold cycle method, whereby the primer efficiency of the primer pairs accounted for >93%. Fold changes were calculated by normalization to the samples evaluated at time point 0. Experiments were performed using the CFX96 real-time detection system that is combined with a C1000 thermal cycler (Bio-Rad). We performed statistical analyses using Prism software (GraphPad). We used one-way ANOVA with Holm–Sidak, Kruskal–Wallis, and Dunn multiple testing depending on the group size (equal or not) and Mann–Whitney testing for comparison of two groups. To determine whether Th cells from infants spontaneously differentiate into Th2 cells, leukocytes were isolated from adenoids and stimulated for 16 h with either anti-CD3– and anti-CD28–coated microbeads (33) or PMA and ionomycin. Subsequently, the expression of IL-4, the master cytokine for Th2 development, and its isoform was analyzed by flow cytometry (Fig. 1A). Two distinct Th2 subsets were identified using two different anti-human IL-4 mAbs, 8D4-8 and MP4 (Fig. 1A, 1B). Whereas MP4 detects IL-4, 8D4-8 detects an isoform of IL-4 (34), but both are widely used interchangeably in many studies. Following anti-CD3 and anti-CD28 stimulation, the frequency of IL-4(8D4-8)+ cells accounted for 18.71 ± 3.82% (mean ± SEM) of the CD4+ T cell population from seven independent donors, whereas IL-4(MP4) and IFN-γ were only observed in ∼0.43 ± 0.05 and 0.24 ± 0.06% of CD4+ T cells (Fig. 1A, 1B). Hence, the expression patterns of the IL-4(8D4-8) isoform, IL-4(MP4), and IFN-γ in seven donors appeared to be highly significant (Fig. 1B). As expected, almost no cells coproducing the IL-4(8D4-8) isoform and IFN-γ were detected (Fig. 1A). Interestingly, following stimulation with PMA and ionomycin, the subset of cells expressing the IL-4(8D4-8) isoform diminished substantially to 3.30 ± 0.81% (mean ± SEM), whereas the proportion of IL-4(MP4)+ and IFN-γ+ cells increased slightly to 0.99 ± 0.29 and 3.59 ± 0.86%, respectively (Fig. 1A, 1B). To date, IL-4(8D4-8)+ T cells have only been described in HIV-infected adults but not in healthy individuals (34). Because the MP4 mAb does not recognize the isoform detected by the 8D4-8 mAb, the specificity of IL-4 detection by the 8D4-8 mAb was verified in T cells derived from neonates by neutralizing the 8D4-8 mAb with nonglycosylated rIL-4 added in excess during the staining procedure (Fig. 1C). No positive cells were detected when rIL-4 was added. High frequencies of IL-4(8D4-8)+CD4+ T cells are present in human infant adenoids. (A) Representative flow cytometric analysis of leukocytes from infant adenoids that were derived from a 16-mo-old donor, cultured for 16 h in serum-free medium, and stimulated either with anti-CD3– and anti-CD28–coated microbeads (top panels) or PMA/ionomycin (bottom panels) in the presence of brefeldin A (BrefA). Subsequently, cells were analyzed for intracellular cytokine expression, with the IL-4 (8D4-8) isoform depicted on the vertical axis and IL-4(MP-4) and IFN-γ shown on the horizontal axis. (B) Compiled data showing the frequencies of IL-4(8D4-8)–, IL-4 (MP4)–, and IFN-γ–expressing CD4+ T cells obtained from the infant adenoids of seven independent donors (16–64 mo). The mean value and SEM are indicated. Differences between number of IL-4(8D4-8)–expressing cells compared with IL-4(MP-4)– and IFN-γ–expressing cells, respectively, under anti-CD3/anti-CD28 treatment are significant (***p < 0.001; one-way ANOVA, Holm–Sidak method). (C) Intracellular flow cytometric staining with specific inhibition of the IL-4(8D4-8) isoform by concomitant incubation of the staining Ab with 10 μg/ml rIL-4. Cells were gated on CD45+CD3+CD4+ T cells. To determine whether Th2 differentiation occurs similarly in neonates and adults, which would lead to comparable expression of the different IL-4 isoforms, we compared the capacity of naive CD45RO−CD45RA+CD4+ T cells from neonates and adults to differentiate into IL-4–producing Th2 cells. Naive CD45RO−CD45RA+CD4+ T cells were enriched from neonatal and adult blood and stimulated or not for 72 h with anti-CD3– and anti-CD28–coated microbeads in serum-free X-VIVO-20 medium (Lonza). A subset of the cells was restimulated with PMA and ionomycin for the last 4 h of the culture. Proportions of IL-4(8D4-8)+ and IL-4(MP4)+ T cells from the activated naive CD4+ T cells obtained from neonates and adults were then determined using flow cytometry (Fig. 2A). Surprisingly, even in the absence of any stimulation, 58.70 ± 3.34% (mean ± SEM) of resting neonatal CD4+ T cells expressed the IL-4(8D4-8) isoform, whereas only 5.40 ± 2.99% of adult CD4+ T cells expressed this form (Fig. 2B). Notably, following restimulation with PMA and ionomycin, the proportion of IL-4(8D4-8)+ cells among adult CD4+ T cells was reduced to less than one-tenth of that observed in neonatal cells (Fig. 2A, 2B). Notably, the difference in frequencies of IL-4(8D4-8)+ T cells between neonates and adults was in the absence of restimulation highly significant and in the presence of PMA and ionomycin restimulation still significant, only to a lesser extent. The presence of the IL-4 isoform in resting neonatal CD4+ T cells was confirmed by MS. After tryptic digestion, two IL-4 peptides were clearly identified by MS/MS in the lysates of these cells (Table I, Supplemental Fig. 2). To determine whether both IL-4 and the isoform were also secreted, an ELISPOT assay was performed. Because the 8D4-8 mAb binds only unglycosylated IL-4 (35) (Fig. 2C, top panel), and the MP4 mAb (Fig. 2C, bottom panel) detects mature IL-4, these two Abs were used for coating. Detection was performed using a polyclonal anti–IL-4 Ab. Notably, secreted IL-4 was unambiguously detected only in ELISPOT assays that used the MP4 mAb for coating (Fig. 2C). Yet, in the graph (Fig. 2D) summarizing the ELISPOT data from eight donors, we took only the presence and absence of a spot into account and not the size of the spot. Therefore, the difference between 0.0260 ± 0.0065% (mean ± SEM) for MP4 and 0.0064% ± 0.0023% for 8D4-8 is a clear underestimation of the difference in secreted IL-4 detected by MP4 compared with 8D4-8. The missing IL-4(8D4-8)+ T cells in the ELISPOT and the high frequency of T cells expressing the IL-4(8D4-8) isoform determined by flow cytometry suggest that the high amount of intracellular IL-4 in neonatal T cells is not secreted and that the secreted glycosylated IL-4 is not detected by the 8D4-8 mAb. A similar observation has been made in CD4+ T cells from adults infected with HIV (34). These findings suggest that the IL-4(8D4-8)+ T cells are Th2-like but have not completed maturation toward the IL-4–secreting Th2 cell phenotype. High frequencies of IL-4(8D4-8)+CD4+ T cells are found in human neonates in contrast to adults. (A) Flow cytometry for expression of the IL-4(8D4-8) isoform in naive neonatal (top panel) or naive adult (bottom panel) CD4+ T cells cultured for 4 d in the absence (not stimulated) or presence of anti-CD3/anti-CD28–coated beads. On day 4, the CD4+ T cells were either stimulated or not for 4 h with PMA and ionomycin in the presence of brefeldin A. Dual intracellular staining for the anti–IL-4(8D4-8) isoform and anti–IL-4(MP4). (B) Compiled data showing the frequencies of IL-4(8D4-8)–expressing CD4+ T cells obtained from six independent neonatal and four independent adult donors. The mean value and SEM are indicated. Differences between the differentially treated neonatal and adult samples are significant (**p < 0.01, ***p < 0.001, ****p < 0.0001, one-way ANOVA, Holm–Sidak method). (C) ELISPOT assay using naive CD4+ T cells cultured for 7 d in the presence of anti-CD3/anti-CD28–coated beads in serum-free medium and reactivated for 16 h either with anti-CD3/anti-CD28–coated beads or PMA and ionomycin. To do so, neonatal naive CD4+ T cells were plated at two different concentrations. Numbers of total cells plated per well are indicated at bottom. The cells were probed for IL-4 in an ELISPOT assay using anti–IL-4(8D4-8) and anti–IL-4(MP4) as coating Ab. Representative data are shown from one out of eight donors. (D) Compiled data showing the frequencies of IL-4(MP4)– and IL-4(8D4-8)–secreting CD4+ T cells obtained from eight independent donors (indicated as A–H). The mean value and SEM are indicated. The difference between the detection obtained with the MP-4 Ab compared with 8D4-8 is significant (**p = 0.0042, Mann–Whitney U test). Because in the paper of Ledru et al. (34), the localization of IL-4(8D4-8) was performed in apoptotic cells with unclear morphology, fluorescent wide-field microscopy was performed to evaluate intracellular stores of the IL-4(8D4-8) isoform. To assess the subcellular localization of the IL-4(8D4-8) isoform, naive CD45RO−CD45RA+CD4+ neonatal and adult T cells were activated with anti-CD3 and anti-CD28 microbeads. On day 3 of culture, cells were fixed and stained with DAPI as well as with the IL-4(8D4-8) isoform during permeabilization. 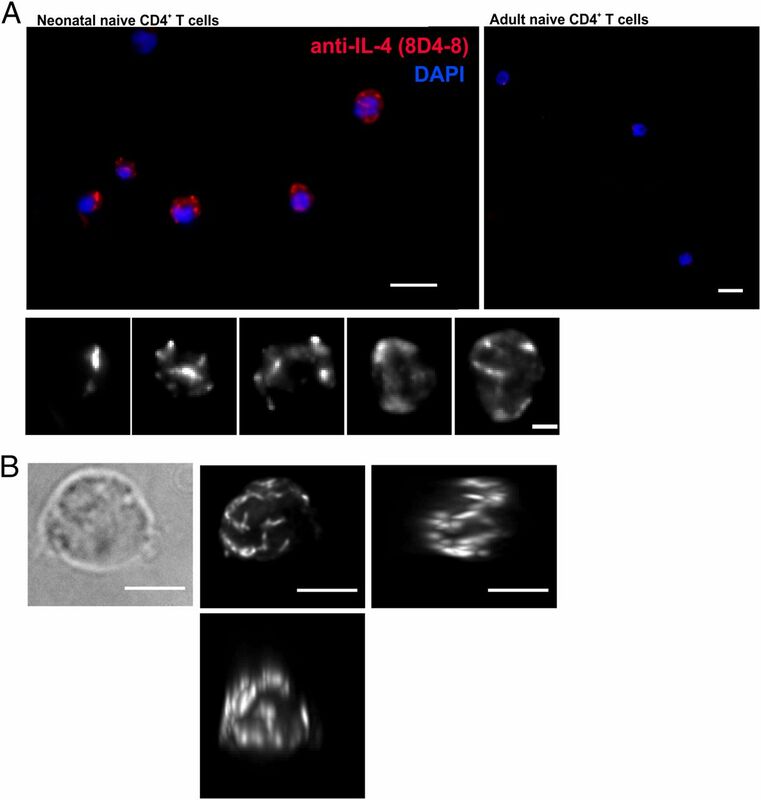 To reveal the intracellular localization of the IL-4(8D4-8) demonstrated by FACS analysis (Fig. 2A, third panel from left), epifluorescent z-stacks were acquired and processed by subsequent deconvolution. Double staining with DAPI and 8D4-8 demonstrates the structured tubelike localization of the IL-4(8D4-8) signal within CD3- and CD28-stimulated naive CD4+ T cells derived from CB (Fig. 3A, top left and bottom panels), but not in the adult control sample (Fig. 3A, top right panel). In the neonatal CD4+ T cells, the IL-4 isoform was unambiguously localized to distinct structures in the cytoplasm of cells that contained an intact nucleus and demonstrated normal morphology. DAPI staining demonstrates intact nuclei, thereby excluding the presence of apoptotic cells. In a single stain with the anti–IL-4(8D4-8) mAb (Fig. 3B), accumulation of the IL-4(8D4-8) isoform was observed in a tubular structural network within the cytoplasm (Fig. 3B, Supplemental Video 1). Thus, the IL-4(8D4-8) isoform that was detected in the adenoids of infants and neonatal CD4+ T cells was observed to segregate in neonatal T cells to distinct subcellular compartments that have a tubular structure. This mapping to distinct compartments implies the highly regulated storage of the IL-4 isoform within the cell. Structured intracellular localization of the IL-4(8D4-8) isoform visualized by epifluorescent microscopy and subsequent deconvolution. (A) Top left panel, Maximum-intensity projection of a 92 × 60 × 12-μm volume after deconvolution demonstrates the structured tubelike localization of the IL-4(8D4-8) signal within naive CD4+ T cells derived from CB stimulated with anti-CD3/anti-CD28 at a ratio (cell/bead) of 1:1. Scale bar, 10 μm. (A) Bottom panel, Even more pronounced in the magnified regions of interest blow. Scale bar, 2 μm. (A) Top right panel, Anti-CD3/anti-CD28–stimulated naive CD4+ T cells derived from adults do not show a comparable IL-4 signal rendition. Scale bar, 10 μm. DAPI staining demonstrates intact nuclei, thereby excluding the presence of apoptotic cells. (B) Transmitted light image and maximum-intensity projections of all orthogonal planes after deconvolution of a 13 × 11 × 15-μm volume from a single stained cell demonstrate the tubular cytoplasmic nature of the IL-4(8D4-8) staining. A short animation of the three-dimensional reconstruction can be found in Supplemental Video 1. We next sought to determine whether neonatal compared with adult naive CD4 T cells show a propensity to secrete IL-4 and whether the expression of the IL-4(8D4-8) isoform in the naive CD45RO−CD45RA+CD4+ neonatal T cells is indicative of subsequently increased levels of IL-4 production. To discriminate also between recent thymic emigrants (CD31+) and homeostatic proliferating T cells (CD31−), naive CD31− and CD31+ T cells were purified from 4-d cultures of adult and neonatal naive CD45RO−CD45RA+CD4+ T cells. To obtain a sufficient amount of naive CD4+ T cells and cells of a high purity, we first performed a CD4-positive enrichment on unlabeled CD45RA+ cells on day 0 and waited for 4 d to let the cells internalize the magnetic beads. We verified by FACS analysis that the CD31 surface expression was not altered significantly between days 0 and 4 (data not shown). This enabled us to perform another cell-enrichment step on day 4, this time to separate CD31− and CD31+ T cells. After 4 d in culture, the enriched CD31− and CD31+ T cell subsets were briefly stimulated with PMA and ionomycin. Using the ELISPOT assay, IL-4–secreting Th2 cells were quantified in neonates and adults (Fig. 4A, 4B). Interestingly, the IL-4–producing neonatal T cells belonged nearly entirely to the CD31− T cell subset (Fig. 4B), as 0.059 ± 0.026% (mean ± SEM) of the CD31−-sorted cells compared with 0.006 ± 0.002% of the CD31+-sorted cells were shown to secrete IL-4. Comparing the quantity of IL-4–secreting CD31− naive T cells between neonates and adults, we found that both show IL-4–secreting cells at low frequencies; however, adults showed only one-tenth of the frequency of IL-4–secreting T cells (i.e., 0.059 ± 0.026 versus 0.006 ± 0.006%). Furthermore, to determine the impact of the Th1- and Th2-biasing cytokines on the capacity of the neonatal cells to differentiate into IL-4–secreting cells, we cultured enriched CD31− naive T cells in the presence of IL-4 or IL-12. Notably, the addition of IL-4 or IL-12 did not significantly alter the frequency of IL-4–secreting cells (Fig. 4C), demonstrating the stability of Th2 differentiation at that early stage during neonatal T cell development. To determine whether the neonatal naive T cells that secreted IL-4, as determined by the ELISPOT assay, also express the IL-4(8D4-8) isoform, CD31+ and CD31− T cells were analyzed by flow cytometry for the production of IL-4 and its isoform. First, the activation of CD31+ and CD31− T cells was monitored according to the expression of IL-2 following brief stimulation with PMA and ionomycin. As expected, CD31− T cells, whether positive or negative for the IL-4(8D4-8) isoform, demonstrated, with 43.3 and 36.4%, a high proportion of IL-2–producing cells, whereas CD31+ T cells show only levels of 9.2 and 19.6%, respectively (Fig. 4D). Next, IL-4 secretion was assessed following PMA and ionomycin restimulation in T cells according to the expression of CD31 and IL-4(8D4-8). A population of 5.9% CD31− naive T cells secreting IL-4 was restricted to the IL-4(8D4-8)+ subset compared with 0.7% of the IL-4(8D4-8)− subset (Fig. 4E), implying that the expression of the nonclassical marker 8D4-8 is indicative of cells, possibly a Th2 precursor, that can differentiate into mature Th2 cells. Collectively, these data demonstrate that neonatal naive CD31−CD4+ T cells are intrinsically more prone than adult T cells to differentiate into functional IL-4–secreting T cells. Moreover, these differentiated cells belong to a large subset of T cells expressing the intracellular IL-4(8D4-8) isoform. Propensity of neonatal naive CD31-CD4+ T cells to secrete IL-4 independently of exogenous cytokines. (A) Experimental setup including the sorting strategy for isolating naive CD31− and CD31+CD4+ T cells. (B and C) Naive CD45RO−CD45RA+CD4+ T cells from neonates and adults that had been resting for 4 d were sorted for CD31− and CD31+ cells. Subsequently, cells from neonates and adults were stimulated for 4 d with anti-CD3/anti-CD28–coated beads either without cytokines (B) or with IL-4 or IL-12 (only neonatal CD31− naive T cells) (C), as compared with untreated control cells (no exogenous [exog.] cytokine), in serum-free medium and reactivated with PMA and ionomycin for 16 h. Finally, the cells were probed for secreted IL-4 in an ELISPOT assay using anti–IL-4(MP4) as coating Ab. To do so, 5 × 105 CD31− or CD31+ neonatal and adult T cells were plated in the upper wells and titrated in 1:5 steps. (B) Diagram depicting the frequencies of IL-4–secreting CD31−CD4+ T cells and CD31+CD4+ T cells obtained from six independent neonatal and three independent adult donors. The mean value and SEM are indicated. Differences between the neonatal and adult CD31−CD4+ T cells and between neonatal CD31−CD4+ T cells and CD31+CD4+ T cells are significant (*p < 0.05, one-way ANOVA, Kruskal–Wallis method). (C) Diagram showing the frequencies of IL-4–secreting CD4+ T cells obtained from four independent neonatal donors under exposure to IL-4 and IL-12 compared with unexposed control cells. The mean value and SEM are indicated. Differences between the differentially treated samples are not significant (one-way ANOVA, Kruskal–Wallis method). (D and E) Naive CD45RO−CD45RA+CD4+ T cells from neonates stimulated and sorted as in (B) were analyzed by flow cytometry for coexpression of secreted IL-2 and IL-4 with IL-4(8D4-8). Dot plots depict staining for the IL-4(8D4-8) isoform on the vertical axis, and dot plots and histograms depict IL-2 (D) and IL-4 (E) staining on the horizontal axis. The solid gate identifies the IL-4(8D4-8)+ T cells, whereas the dotted frame indicates the IL-4(8D4-8)− T cells. In the histograms, the IL-2– (D) and IL-4–positive (E) cells were compared between the CD31+ (gray) and CD31− (black) cell populations. To determine whether neonatal T cells are transcriptionally biased to run a Th2 program, GATA3 mRNA levels were measured in CD45RO−CD45RA+CD4+ T cells enriched from neonates and adults on 3 consecutive d following the onset of stimulation (Fig. 5A). Cells were stimulated by the addition of anti-CD3– and anti-CD28–coated microbeads. Overall, the expression of GATA3 was only slightly but unambiguously regulated after stimulation. Nevertheless, it was modestly elevated in neonatal compared with adult naive CD4+ T cells as early as day 3 after stimulation with an expression of 2.06 ± 0.78% in neonates compared with 0.41 ± 0.24% in adults relative to day 0. Also, focusing on individual samples, naive CD4+ T cells derived from adults show a lower expression of GATA3 mRNA following stimulation compared with neonates. This finding demonstrates that upon activation, neonatal T cells are more prone to express the Th2 master transcription factor, thus underscoring the preferential induction of a Th2 program in neonates. To assess the impact of STAT6 on the bias toward Th2 differentiation, which has been shown to be triggered by STAT6-dependent and independent mechanisms (36), STAT6 expression was analyzed. There was no significant difference observed in STAT6 expression between neonates and adults upon anti-CD3 and anti-CD28 stimulation (Fig. 5B). Hence, STAT6-independent mechanisms may contribute to the intrinsic bias toward a GATA3-mediated Th2 program in neonatal T cells. GATA3 mRNA expression and stability of the IL-4 isoform expression characterize the neonatal IL-4 isoform expressing naive CD4+ T cells. Real-time quantitative PCR analysis assessing the time course of GATA3 (A) and STAT6 (B) mRNA expression in neonatal and adult naive CD4+ T cells stimulated with anti-CD3/anti-CD28 at day 0. Data are summarized from seven neonatal and five adult independently tested donors. The mean value and SEM are indicated. The GATA3 mRNA levels of neonatal compared with adult naive CD4 T cells were significantly enhanced on day 3 (*p < 0.05, one-way ANOVA, Kruskal–Wallis method with post hoc Dunn multiple comparison). (C) Naive neonatal CD4+ T cells cultured for 7 d in the absence (not stimulated) or presence of anti-CD3– or anti-CD3/anti-CD28–coated beads. An assessment of the proliferation of IL-4(8D4-8)+ cells on day 7 was performed by costaining for the IL-4(8D4-8) isoform and CFSE, as indicated. Cells were further gated according to the number of cell divisions (G0–G7), and frequencies of undivided and divided IL-4(8D4-8)− and IL-4(8D4-8)+ cells are indicated in the grid at the top of each dot plot. Representative data are shown from one out of three experiments. To investigate the effects of stimulation-induced cell-cycle progression on the stability and differentiation of IL-4(8D4-8)+ T cells, naive neonatal CD45RO−CD45RA+CD4+ T cells were labeled with CFSE and then left untreated, stimulated with anti-CD3–coated microbeads, or stimulated with anti-CD3– and anti-CD28–coated microbeads. On day 7 of stimulation, proliferation was assessed by measuring the CFSE dilution by flow cytometry (Fig. 5C). The CFSE staining revealed cells expressing the IL-4(8D4-8) isoform in undivided (G0 cells) as well as in all other generations (G1–G7). This finding demonstrates that the expression of the IL-4(8D4-8) isoform is independent of the cell cycle and, importantly, that it probably characterizes T cell subsets in addition to anergic or regulatory T cells, which are both resistant to cell-cycle progression. To analyze the effect of the cytokine environment on the plasticity of the Th2-like program in neonatal T cells, we assessed the effect of the addition of exogenous cytokines on the differentiation of IL-4(8D4-8)+ T cells. Naive CD45RO−CD45RA+CD4+ neonatal T cells were stimulated with anti-CD3– and anti-CD28–coated microbeads for 7 d in serum-free medium supplemented with either the cytokine IL-4 or IL-1β, IL-6, and IL-12 with and without TGF-β (Fig. 6). When T cells were activated in the presence of exogenous IL-4, the frequency of IL-4(8D4-8)+ T cells steadily decreased with increasing concentrations of IL-4 from 54.0/30.1% in the absence of IL-4 down to 13.3/15.9% at 20 ng/ml IL-4 (Fig. 6A). Notably, there is a slight shift visible in the IL-4(MP4) population under the addition of 20 ng/ml IL-4 leading to 34.1/19.1%, which in our view is probably due to the exogenous IL-4 bound to the IL-4R on these cells. To undermine the negative effect of IL-4 on the intrinsic IL-4(8D4-8) expression, we performed immunoblotting with the cell lysates. In the absence of exogenous IL-4, high levels of IL-4 (likely the isoform) were detected using a polyclonal anti–IL-4 Ab by SDS-PAGE and Western blotting (Fig. 6B). In addition, the level of detectable IL-4 increased slightly in the presence of 0.2 ng/ml of IL-4. As expected from flow cytometric measurements (Fig. 6A) and the STAT6-independent findings described above (Fig. 5B), the level of the IL-4(8D4-8) isoform was reduced when IL-4 was added in excess (2 ng/ml). Moreover, exposure to proinflammatory cytokines during neonatal T cell stimulation reduced the expression of the IL-4(8D4-8) isoform by 30–50% compared with the medium only control (Fig. 6C, 6D). Importantly, IL-1β and IL-12 triggered substantial IFN-γ production in 5.4 and 15.8%, respectively, of the IL-4(8D4-8)− cells (Fig. 6C, 6E). The mutually exclusive expression of IFN-γ and the IL-4(8D4-8) isoform upon stimulation demonstrated a classical Th1/Th2 dichotomy, in which the IL-4(8D4-8) isoform signified the Th2 program. Notably, the addition of TGF-β reversed the IL-1β– and IL-6–mediated downregulation of IL-4(8D4-8) isoform expression and also enhanced its expression (Fig. 6C, 6D), whereas it suppresses, as expected, IFN-γ expression (Fig. 6C, 6E). Thus, the observed bias for neonatal T cells to acquire the Th2 phenotype was highly plastic in the presence of proinflammatory stimuli and was stabilized or even enhanced by the presence of anti-inflammatory TGF-β (Fig. 7). Modulation of the neonatal intrinsic Th2 program by proinflammatory cytokines and TGF-β. Naive neonatal CD4+ T cells cultured for 4 (A) or 7 d (B, C) in the presence of anti-CD3/anti-CD28–coated beads. On days 4 and 7, a portion of the naive T cells were stimulated for 4 h with PMA and ionomycin in the presence of brefeldin A. (A and B) Exogenous IL-4 was added to the T cells as indicated (wedges indicate 10-fold increments from 0.2 to 20 ng/ml). (A) On day 4, cells were analyzed for intracellular cytokine expression, with the IL-4(8D4-8) isoform depicted on the vertical axis and IL-4 depicted on the horizontal axis. Representative data from two donors out of four are presented. (B) Cell lysates were probed for IL-4 in the Western blot. Relative protein expression levels were normalized to GAPDH, and the ratios are indicated below the respective band. (C) Cells were cultured in the presence of IL-1β, IL-6, and IL-12 in the absence (top panel) or presence (bottom panel) of TGF-β. On day 7, cells were analyzed for intracellular cytokine expression of the IL-4(8D4-8) isoform and IFN-γ, as indicated. Representative data are shown from one out of two experiments. Summarized data showing the frequencies of IL-4(8D4-8)– (D) and IFN-γ–expressing (E) CD4+ T cells obtained from two independent neonatal donors. The mean value and SEM are indicated. Model visualizing the occurrence of intracellular IL-4 in the age-dependent naive T cell pools. The results provide evidence for a preferential expression of high levels of intracellular IL-4 (IL-4 ic) in the naive T cell population of thymicCD31+ naive T cells. These cells are far more abundant in neonates compared with adults, who host primarily centralCD31+ naive T cells (21). Depending on the context (sterile is nonstimulatory and anti-inflammatory; nonsterile is stimulatory and proinflammatory), the equilibrium between the two naive T cell pools and thereby the level of IL-4 ic–expressing cells is changed. The determination of the IL-4 isoform–expressing cells in humans allows the identification of Th2 precursor cells, which could help to identify risk patients prone for Th2-driven diseases such as allergies. Additionally, the expression of IL-4 ic is lost in recent thymic emigrants upon aging, which can be explained by a concept of age-dependent waves of lymphopoietic cells as part of a layered immune system (24). The scheme was drawn using pictures from Servier Medical Art. By demonstrating that an IL-4 isoform is expressed in resting as well as stimulated neonatal CD4+ T cells but not in CD4+ T cells from adults, we report for the first time, to our knowledge, that naive human neonatal CD4+ T cells have an intrinsic bias to develop an IL-4–signified Th2 phenotype. This finding is corroborated by an elevated GATA3 expression after T cell stimulation in naive CD4+ T cells from neonates compared with adults. Even though the IL-4 isoform was not secreted by neonatal naive CD4+ T cells, a propensity of IL-4 secretion was also observed in CD31− naive T cells from neonates compared with adults. The determination of the IL-4 isoform expressing cells in humans could allow the identification of Th2 precursor cells, which could help to identify risk patients prone for Th2-driven diseases. Our findings further show that expression of the IL-4 isoform identifies a novel Th2 cell subset during infancy. These Th2 cells probably require further differentiation to become mature Th2 cells. The IL-4 isoform expressed in these early Th2 cells was sequestered in defined subcellular organelles, as previously demonstrated for IL-4 and other molecules (37, 38). However, this isoform was not secreted in our experimental setup, which may be due to the lack of additional triggering signals. As previously described for other cytokines (37, 39, 40), different secretory pathways requiring different triggers may exist for IL-4 release. Thus, it is possible that these pathways differ during ontogeny in T cells, and further investigation is required to clarify whether the IL-4 isoform from human neonatal CD4+ T cells must be modified prior to its release. It will be of great interest to characterize the stimuli necessary for IL-4 secretion following anti-CD3 and anti-CD28 stimulation of neonatal T cells expressing the IL-4 isoform. For example, in eosinophils, eotaxin acts as a special trigger for the release of IL-4 that is bound to IL-4R and sequestered in specialized intracellular vesicles (38). Importantly, we demonstrate in this study that naive neonatal CD4+ T cells derived from naive CD45RA+CD45RO−CD4+ T cells are more prone to express the IL-4 isoform than are adult cells. This diverse expression pattern demonstrates the difference between neonatal and adult naive CD4+ T cells. Even in the absence of anti-CD3 and anti-CD28 stimulation, which mimics TCR-mediated signaling, the CD4+ subset of naive neonatal CD4+ T cells expressed the IL-4 isoform. After activation, the IL-4–secreting cells appeared among the neonatal CD31−CD4+ T cells, thus verifying previous observations that characterized the phenotype of IL-4–secreting T cells (41). In Fig. 7, we provide a model that visualizes the age-dependent localization and relevance of the IL-4 isoform–expressing T cells in the context of human naive CD4+ T cell homeostasis. Our data propose that the phenomenon of the intracellular IL-4 can be integrated into either of two models that have been suggested recently for the homeostasis of naive CD4+ T cells. First, our results could suggest a reduced expression of the intracellular IL-4 in the thymicCD31+ subset of naive T cells in the aged. Thus, it would provide evidence for the existence of age-dependent lymphopoietic waves as part of the layered immune system hypothesis (24). Secondly, our data also suggest a preferential expression of the intracellular IL-4 in the subset of thymicCD31+ naive T cells and not in centralCD31− naive T cells fitting well into the model of these two types of naive T cell subsets and their differential age-dependent distribution in the naive T cell compartment (21, 23). The integration in the later model is also reflected by our results on the impact of pro- and anti-inflammatory cytokines (nonsterile and sterile environments) on the expression of intracellular IL-4. Although it has been suggested previously that peripheral CD31−CD4+ T cells are the principal T cell subset to secrete IL-4 and provide B cell help (42), others have previously reported that downregulation of CD31 occurs in parallel with Th2 and Th1 cell differentiation (43). Our results suggest that CD31 downregulation is attributed to pre-Th2 cells originating from thymicCD31+ naive T cells and signifies that differentiation into IL-4–producing cells is underway. Furthermore, this notion is supported by the bias of neonatal naive CD31−CD4+ T cells to secrete IL-4 upon stimulation. In contrast to this bias observed in infants, IL-4 secretion appeared independent of CD31 expression in adult CD4+ T cells. The expression of GATA3, the master transcription factor of Th2 cells, was observed to be higher in neonatal than in adult CD4+ T cells (Fig. 5A). As GATA3 is necessary for the development of CD4 single-positive T cells in the thymus, this factor might be favorably expressed at basal levels in thymicCD31+ naive T cells that constitute the peripheral pool of naive CD4+ T cells (44–46). In mice, an endogenous Th2 program characterized by an enhanced GATA3 expression has been postulated that is suppressed by exogenous stimuli via T-bet (47). The IL-4 isoform seems to be an additional marker for such an endogenous Th2 program. Our results demonstrate that even exogenous IL-4 leads to the downregulation of the IL-4 isoform, which is in line with the observed unstable cytokine production profile in Th2 populations generated in the presence of rIL-4 (48). Interestingly, previous studies also described the presence of naive mouse CD4+ T cells that express IL-4 mRNA (30–80% of all cells) without the addition of exogenous IL-4 (49). In addition, these results are in agreement with previous data showing STAT6-independent GATA3 expression induced by a low dose of Ag (50). Because expression of the IL-4 isoform in neonatal T cells is strongly downmodulated by proinflammatory cytokines, we propose that the early induction of the IL-4 isoform represents a default pathway for naive CD4+ T cells differentiation under certain circumstances, such as an immunosuppressive cytokine milieu. Expression of the IL-4 isoform may also reflect the response to anergic-like stimuli, which have been suggested to induce a Th2, rather than Th1, phenotype (51). In view of a concept stating that less activation (also bystander activation) leads to Th2, whereas strong activation favors Th1 differentiation (52), the neonatal naive CD4+ T cells reside on a scale from minimal to maximal exposure to quantitative events, such as dose, duration of the Ag contact, and the gradient of CD4+ T cell subset–defining transcription factors (4, 53), at the minimum endpoint. It is tempting to speculate that under such circumstances the IL-4 isoform might be induced. With the age-dependent difference in naive CD4+ T cells, we add another determining factor to the concept. Others have connected IL-4 to apoptosis (e.g., in a previous study on cancer cell lines that IL-4 production can be induced downstream in the apoptotic pathway, whereas IFN-γ production was impaired) (54). In addition, Ledru et al. (34) implicated apoptosis in IL-4(8D4-8) expression. They suggested that deprivation apoptosis in Th1 cell lines and in the CD4+ T cells of HIV patients induces the de novo synthesis of the IL-4δ13. Thus, IL-4 isoform expression could lead to induction of an apoptotic pathway. However, it has not yet been resolved how the two events (IL-4 form isoform production and apoptosis) mutually depend on each other (34, 54, 55). Hence, in terms of a Th1/Th2 model depending on the strength of T cell activation, the lack of bystander signaling in neonatal naive CD4+ T cells in the periphery could lead to a Th2 bias, with the expression of the IL-4 isoform leading to a type of T cell death by neglect or in case of survival signals to mature Th2 cells. Moreover, the neonatal pre-Th2 cells described in this study may correspond to the IL-4 isoform–producing cells that have been detected in HIV-infected individuals (34). However, it must be further investigated whether the formation of these cells is stimulated by HIV and other viruses to circumvent the cellular immune response. To our knowledge, our data represent the first evidence that human neonatal T cells are skewed toward an IL-4–signified Th2 phenotype. 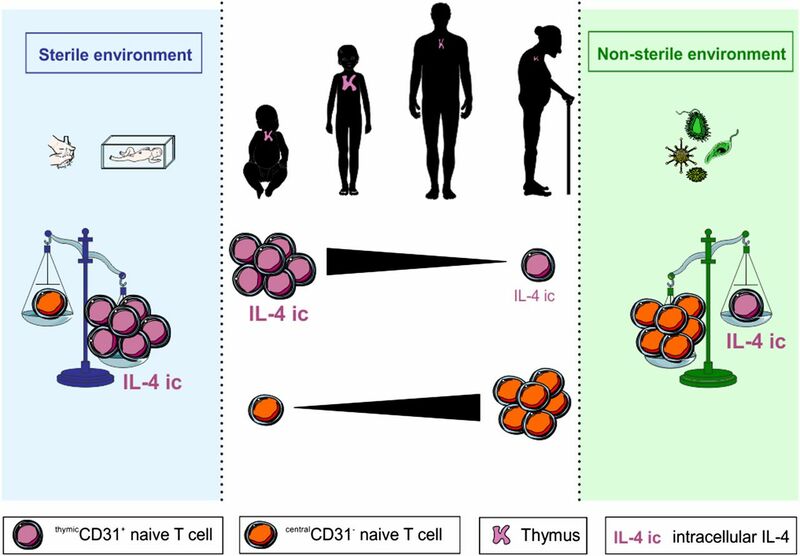 The differences between neonatal and adult naive CD4+ T cells have been recently reviewed (56), but the difference in IL-4 expression that we report in this study has not been previously described. In vitro studies have shown diminished Th1 responses and reduced levels of IFN-γ in neonatal CD4+ T cells as compared with adult CD4+ T cells, presumably due to hypermethylation at CpG and non-CpG sites within the IFN-γ promoter (57). Equivalent studies have not been conducted for the master Th2 cytokine IL-4. Our findings regarding the Th2 bias (but plastic nature) of neonatal T cells may have significant implications for trials (58) that use the ex vivo expansion of naive CB cells to promote improved T cell reconstitution and the potential to mount effective immune responses. Furthermore, in a general context and in light of the hygiene hypothesis (3), our findings provide new evidence that in the susceptible state of the newborn, the first wave of naive CD4+ T cells is poised toward Th2 differentiation as part of a layered immune system characterized by CD4+ T cells that change their phenotype in an age-dependent manner. Besides, it is tempting to speculate that this bias during infancy strongly contributes to atopic diseases later in life if the cells are not engaged by proinflammatory stimuli. We thank Robert S. Jack for critical reading and K. Kramer and B. Kramer for excellent laboratory assistance.
. 2002. Relationship of viral infections to wheezing illnesses and asthma. Nat. Rev. Immunol. 2: 132–138. 2007. Coming back to a missing immune deviation as the main explanatory mechanism for the hygiene hypothesis. J. Allergy Clin. Immunol. 119: 1511–1513.
. 1997. Induction of Th1 and Th2 CD4+ T cell responses: the alternative approaches. Annu. Rev. Immunol. 15: 297–322.
. 2004. Distinct regions in the CD28 cytoplasmic domain are required for T helper type 2 differentiation. Nat. Immunol. 5: 435–442.
. 2001. Akt provides the CD28 costimulatory signal for up-regulation of IL-2 and IFN-gamma but not TH2 cytokines. Nat. Immunol. 2: 37–44.
. 1993. Development of TH1 CD4+ T cells through IL-12 produced by Listeria-induced macrophages. Science 260: 547–549.
. 1990. Generation of interleukin 4 (IL-4)-producing cells in vivo and in vitro: IL-2 and IL-4 are required for in vitro generation of IL-4-producing cells. J. Exp. Med. 172: 921–929.
. 2001. Single-cell analyses reveal two defects in peptide-specific activation of naive T cells from aged mice. J. Immunol. 166: 3151–3157.
. 2005. Signal transduction in the aging immune system. Curr. Opin. Immunol. 17: 486–491.
. 2002. Age-dependent defects in TCR-triggered cytoskeletal rearrangement in CD4+ T cells. J. Immunol. 169: 5021–5027.
. 2010. Bim dictates naive CD4 T cell lifespan and the development of age-associated functional defects. J. Immunol. 185: 4535–4544.
. 2006. T-helper type 2 polarization among asthmatics during and following pregnancy. Clin. Exp. Allergy 36: 892–898.
. 2000. T-cell function in the human newborn. Immunol. Today 21: 107–108.
. 2009. Th1/Th2 patterns and balance in cytokine production in the parents and infants of a large birth cohort. J. Immunol. 182: 3285–3293.
. 2003. Reduced expression of NFAT-associated genes in UCB versus adult CD4+ T lymphocytes during primary stimulation. Blood 102: 4608–4617.
. 2002. Two subsets of naive T helper cells with distinct T cell receptor excision circle content in human adult peripheral blood. J. Exp. Med. 195: 789–794.
. 2005. Post-thymic in vivo proliferation of naive CD4+ T cells constrains the TCR repertoire in healthy human adults. Eur. J. Immunol. 35: 1987–1994.
. 2009. Life after the thymus: CD31+ and CD31- human naive CD4+ T-cell subsets. Blood 113: 769–774.
. 2011. Reduced production of B-1-specified common lymphoid progenitors results in diminished potential of adult marrow to generate B-1 cells. Proc. Natl. Acad. Sci. USA 108: 13700–13704.
. 1989. Toward a layered immune system. Cell 59: 953–954.
. 1998. Differential susceptibility to activation-induced apoptosis among peripheral Th1 subsets: correlation with Bcl-2 expression and consequences for AIDS pathogenesis. J. Immunol. 160: 3194–3206.
. 1999. Three-dimensional imaging by deconvolution microscopy. Methods 19: 373–385.
. 2001. A workingperson’s guide to deconvolution in light microscopy. Biotechniques 31: 1076–1078, 1080, 1082 passim.
. 2010. Identification of phosphorylation-dependent interaction partners of the adapter protein ADAP using quantitative mass spectrometry: SILAC vs (18)O-labeling. J. Proteome Res. 9: 4113–4122.
. 2009. Over-expression of forkhead box P3 and its association with receptor activator of nuclear factor-kappa B ligand, interleukin (IL) -17, IL-10 and transforming growth factor-beta during the progression of chronic periodontitis. J. Clin. Periodontol. 36: 396–403.
. 2008. Interleukin-4 induces the activation and collagen production of cultured human intrahepatic fibroblasts via the STAT-6 pathway. Lab. Invest. 88: 973–985.
. 2011. IL-1β and TGF-β act antagonistically in induction and differentially in propagation of human proinflammatory precursor CD4+ T cells. J. Immunol. 187: 5627–5635.
. 2003. A nonsecreted variant of interleukin-4 is associated with apoptosis: implication for the T helper-2 polarization in HIV infection. Blood 101: 3102–3105.
. 1991. Development of immunoassays for human interleukin 3 and interleukin 4, some of which discriminate between different recombinant DNA-derived molecules. Cytokine 3: 562–567.
. 1999. Stat6-dependent and -independent pathways for IL-4 production. J. Immunol. 163: 6536–6540.
. 2006. T cells use two directionally distinct pathways for cytokine secretion. Nat. Immunol. 7: 247–255.
. 2006. 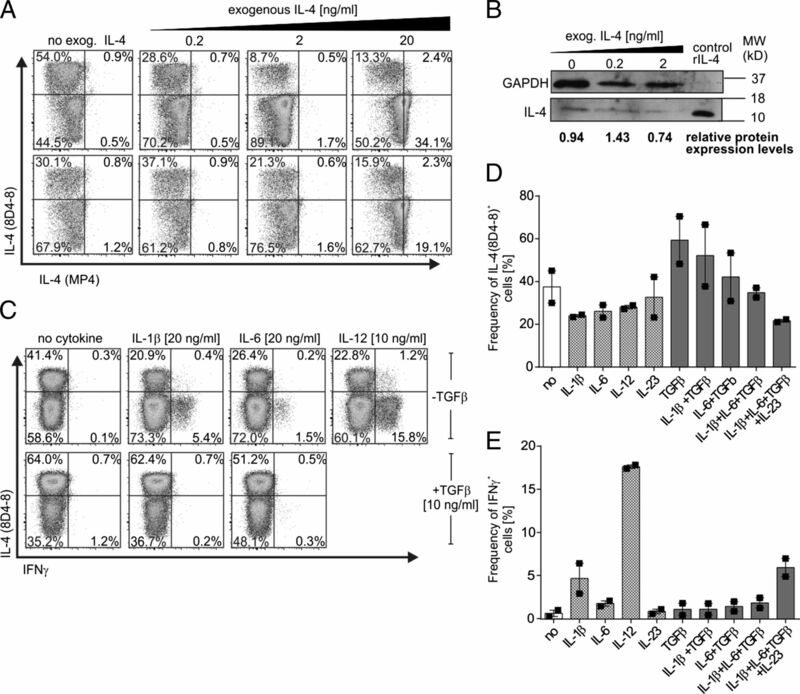 Cytokine receptor-mediated trafficking of preformed IL-4 in eosinophils identifies an innate immune mechanism of cytokine secretion. Proc. Natl. Acad. Sci. USA 103: 3333–3338.
. 1991. Polarized expression of cytokines in cell conjugates of helper T cells and splenic B cells. Proc. Natl. Acad. Sci. USA 88: 775–779.
. 1994. Small splenic B cells that bind to antigen-specific T helper (Th) cells and face the site of cytokine production in the Th cells selectively proliferate: immunofluorescence microscopic studies of Th-B antigen-presenting cell interactions. J. Exp. Med. 179: 1507–1515.
. 1994. In vitro maturation of human neonatal CD4 T lymphocytes. I. Induction of IL-4-producing cells after long-term culture in the presence of IL-4 plus either IL-2 or IL-12. J. Immunol. 152: 1141–1153.
. 1992. CD31, a novel cell surface marker for CD4 cells of suppressor lineage, unaltered by state of activation. J. Immunol. 148: 388–396.
. 1996. CD31 (PECAM-1) is a differentiation antigen lost during human CD4 T-cell maturation into Th1 or Th2 effector cells. Immunology 88: 110–115.
. 2003. GATA-3 expression is controlled by TCR signals and regulates CD4/CD8 differentiation. Immunity 19: 83–94.
. 2009. GATA3 and the T-cell lineage: essential functions before and after T-helper-2-cell differentiation. Nat. Rev. Immunol. 9: 125–135.
. 2011. An updated view on transcription factor GATA3-mediated regulation of Th1 and Th2 cell differentiation. Int. Immunol. 23: 415–420.
. 2012. The transcription factor T-bet is induced by multiple pathways and prevents an endogenous Th2 cell program during Th1 cell responses. Immunity 37: 660–673.
. 1996. Differentiation and stability of T helper 1 and 2 cells derived from naive human neonatal CD4+ T cells, analyzed at the single-cell level. J. Exp. Med. 184: 473–483.
. 1989. 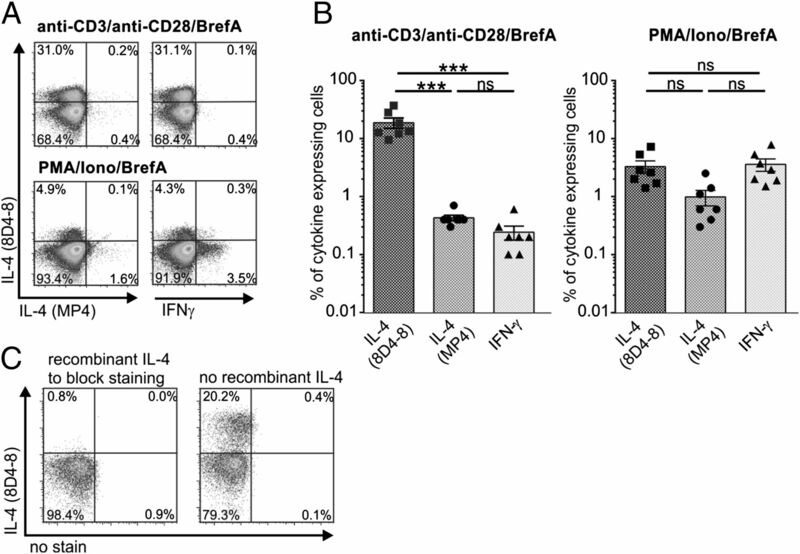 Differential activation of cytokine genes in normal CD4-bearing T cells is stimulus dependent. Eur. J. Immunol. 19: 231–238.
. 2006. GATA-3 promotes Th2 responses through three different mechanisms: induction of Th2 cytokine production, selective growth of Th2 cells and inhibition of Th1 cell-specific factors. Cell Res. 16: 3–10.
. 1989. Regulation of T-cell activation: differences among T-cell subsets. Immunol. Rev. 111: 79–110.
. 1994. “Anergy” of TH0 helper T lymphocytes induces downregulation of TH1 characteristics and a transition to a TH2-like phenotype. J. Exp. Med. 179: 481–491.
. 2011. Quantitative events determine the differentiation and function of helper T cells. Nat. Immunol. 12: 288–294.
. 2000. Expression of interleukin-4 in apoptotic cells: stimulation of the type-2 cytokine by different toxins in human peripheral blood mononuclear and tumor cells. Cytometry 41: 261–270.
. 2000. Intracellular expression of IL-4 and inhibition of IFN-gamma by extracts from European mistletoe is related to induction of apoptosis. Anticancer Res. 20: 2987–2994.
. 2002. Differential patterns of methylation of the IFN-gamma promoter at CpG and non-CpG sites underlie differences in IFN-gamma gene expression between human neonatal and adult CD45RO- T cells. J. Immunol. 168: 2820–2827.
. 2006. In vitro priming and expansion of cytomegalovirus-specific Th1 and Tc1 T cells from naive cord blood lymphocytes. Blood 108: 1770–1773.